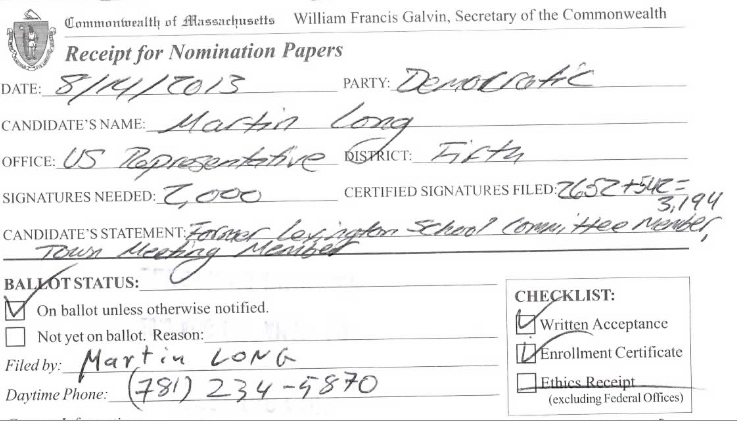 Today is the deadline for submitting signatures to the Secretary of the Commonwealth for ballot entry as a party candidate (Democrat, of course) for Massachusetts’ 5th Congressional District. The requirement is at least 2,000 certified signatures (which means from registered Democrats or unenrolled voters) within the District. My final count: 3,194. I personally got over 1,900 myself. The campaign website, MartinLongForCongress.com will be up sometime next week. Please stay tuned. My book, The Reagan Memes: The Path from Reagan Conservatism to Modern Day Gridlock (and how to get out of it) will also be available on Amazon in mid-August. Very soon. Stay tuned for more on the book as well. The Democratic primary is on October 15, 2013. If you live in the Boston area, in the 5th Congressional district, don’t forget to register to vote! I look forward to talking with more and more neighbors. I love this stuff and learn so much every day. Thanks for giving me this opportunity everyone.